Are You or Someone You Love Among the Millions Struggling with Sight Loss? Legally-blind Author William McGee Tells How He Got Back To Writing in His Inspiring New Book and Audio CD, "Learning To Cope With Sight Loss." As a Public Service, the Author is Offering the Booklet as a Free Downloadable PDF Document from http://www.SightLossTheBook.com. In spring 2009, William L. McGee, a World War II veteran and legally-blind since 2003 from Age-related Macular Degeneration, resided for six weeks with 30 other low vision veterans at the VA Western Blind Rehabilitation Center in Palo Alto, California and together they learned new ways to cope with their sight loss. The Audio CD version is a complete text recording of the book and may be ordered separately. McGee, a broadcaster for 32 years, secured the volunteer services of four San Francisco Broadcast Legends to read the text: Don Mozley (CBS Radio and KCBS/74), Ed Dudkowski (formerly KPIX-TV and KRON-TV), Emmy award winning news anchor Cheryl Jennings (ABC 7/KGO TV), and Warren Weagant (formerly ABC 7/KGO Radio and TV). 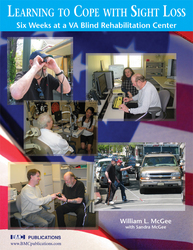 Learning to Cope with Sight Loss: Six Weeks at a VA Blind Rehabilitation Center by William L. McGee with Sandra McGee (BMC Publications, 2010) is available direct from the publisher at http://www.SightLossTheBook.com or from Amazon. Please specify the version you wish to order: Booklet & Audio CD set, $15.95, softcover booklet, 36 pp, 35 color photographs, 1 CD (75 minutes), ISBN-13: 978-0-9701678-2-8; or Audio CD only, $12.95,, ISBN-13: 978-0-9701678-3-5. Please visit TheNewsroom/Media Materials to request a review copy, schedule an interview, or access media materials and photos online. Click on “Video Clips” to watch interview clips with the authors. William L. McGee enjoyed a 32-year career in the film, radio and TV industry. He is the author of numerous books including the acclaimed Pacific war trilogy, Amphibious Operations in the South Pacific in World War II. He and his co-author/wife, Sandra, have appeared on numerous radio and TV programs. BMC Publications is an imprint of Broadcast Marketing Company (“BMC”) founded in 1971 by William L. McGee to provide sales support and training services to radio and TV stations. Titles in print include Amphibious Operations in the South Pacific in World War II, A Pacific War Trilogy; Bluejacket Odyssey, 1942-1946: Guadalcanal to Bikini, Naval Armed Guard in the Pacific; The Divorce Seekers: A Photo Memoir of a Nevada Dude Wrangler. 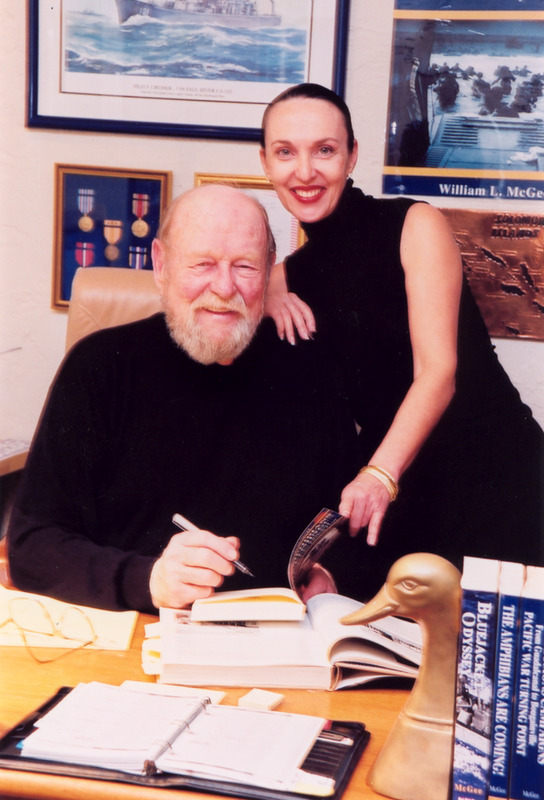 Authors Bill and Sandra McGee(Photo Joanne A. Calitri) A Pacific war trilogy"Amphibious Operations in the South Pacific in World War II" by William L. McGee: Vol. I, The Amphibians Are Coming!, Vol. II, The Solomons Campaigns, Vol. III, Pacific Express. "Enough gripping drama, heroism, and heartbreak in McGee's almost encyclopedic work to supply Hollywood with material for a century." -Marine Corps League. Publishers special - $75 + S&H for the 3-volume series (30% savings ). Order direct from www.BMCpublications.com.